Hi. I am running X-Plane 11.26 and Windows 10. I have extracted and installed the complete "124thATCv2.0-a59" folder into my X-Plane Resources/Plugins folder. 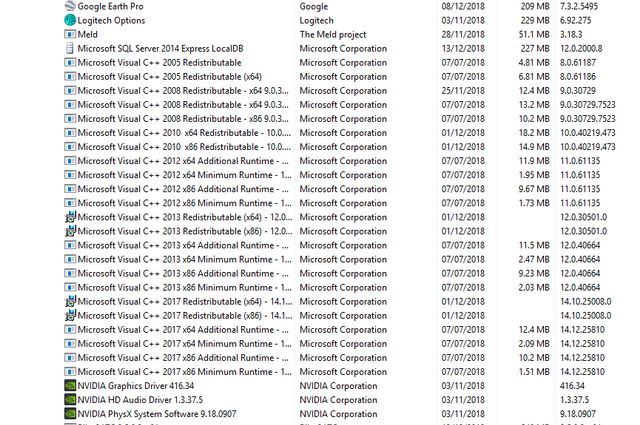 I have also used the Visual C++ Runtime Installer (All-In-One) tool to install the C++ Redistributables. I still can not get 124thATC to show in my Plugins menu at the top of the X-Plane screen. Last year installing this plug-in in X-plane 10 there was no problem what so ever! What went wrong this time? The Map and the bugreport. D:\Programma's/X-Plane 11/Resources/plugins/124thATC64/win_x64/124thATC64.xpl : Error Code = 126 : Kan opgegeven module niet vinden. D:\Programma's/X-Plane 11/Resources/plugins/124thATC64/64/win.xpl : Error Code = 126 : Kan opgegeven module niet vinden. Removed the C++ items. No result! 124thATC doesn't appear in the Plug-inbox. Is that the problem? If so wich should I install? You miss all the redists! have a look to myne screenshot, I have all them installed, you only the 2017! 126/127 code are always related to missing libs. Goodnight. Until 2 days ago, the plugin worked well for me. But after formatting my disk, and installing everything again, I do not see the plugin in the xplane menu. I reinstalled it correctly in the resources folder, plugins folder. Some help? Please read carefully all the thread, all the info you need are here and in the documentation. You basically need to install the c++ libraries. Also verify the plugin installation folder. Everything is covered by faqs and documentation. I have already solved it. Thank you very much!!! !